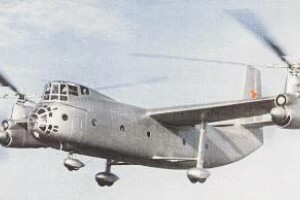 The Ka-22 Vintokryl ('Screw Wing') was a large twin-turboshaft powered convertiplane that debuted at the Soviet National Aviation Day display on 9 July 1961 in Tushino. At each end of the high, straight wing, was a 6,500 shp Soloviev D-25VK engine which powered a four-bladed rotor for vertical flight and a four-bladed propeller for cruise. Each engine was progressively clutched between the two systems to transition between the two modes of flight. The engine was a nine-stage single spool turboshaft modified from the 5,500 shp D-25V engine used on the Mil Mi-6, Mi-10, and V-12 helicopters. The final turbine stage was a free-wheel that drove the gearbox. The fuselage housed a loading ramp that could be used for freight or vehicles, and could carry 36,400 lb of cargo or 80 seats (although this was never done). The tricycle landing gear was fixed and the entire nose area was glazed for good visibility, especially in landing. The high flight deck accommodated two pilots, a radio operator and engineer. Flight testing began on 20 April 1960. On 7 October 1961, the Vintokryl set a Class E. II speed record of 221.4 mph over a 15/25 km course. On 24 November 1961, it lifted a record payload of 36,343 lb to a height of 6,562 ft (2 km), as well as several other payload to altitude records. The Ka-22 was abandoned after a crash in 1964. 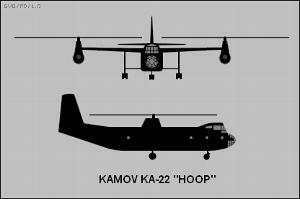 Resources related to the Ka-22 Vintokryl, provided by the Vertical Flight Society. Resources related to the Ka-22 Vintokryl, provided by public sources across the internet.